This makes a lovely gift for the tarot lover in your life! 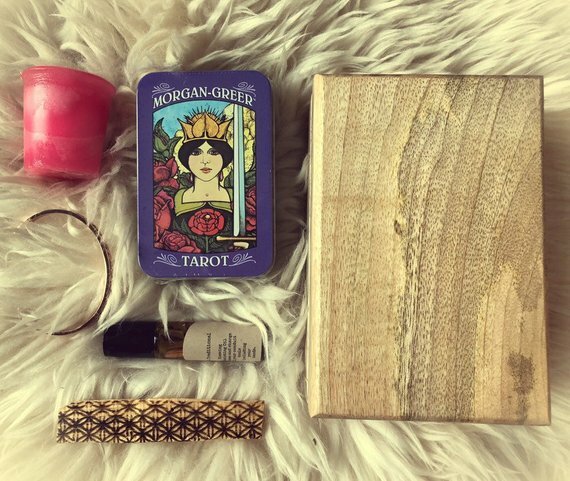 The blonde finished wood box measures 6 x 4“ and includes the Morgan Greer tarot deck in a tin, a Blessing anointing oil, a Nirvana votive candle, a rose gold plated bracelet etched with the message "each breath is a dance with the divine " and an flower-of-life etched Palo Santo stick. 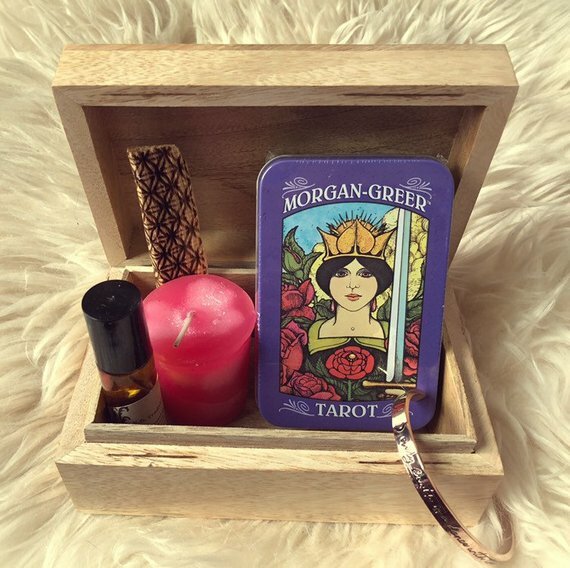 ***PLEASE NOTE - the box will hold the deck or the items, but not all items will fit in the box at once *** The Morgan Greer deck has the traditional symbolism of the Rider Waite deck, marketing the cards easily recognizable. The anointing oil can be used to anoint the deck itself, your hands before a reading, your third eye etc. Made with geranium, frankincense and Palo Santo oil? Use the Palo Santo stick to cleanse and charge the deck before readings.